Motion sensors are a core piece to most alarm systems. Because of their importance and functionality, it’s rare to see a security system without one, but why is that? How do they enhance security? Frontpoint security systems are equipped to support a number of motion sensors, allowing you to add as many that is needed for your home. There’s no need to put a sensor near every window or entry door because of their long viewing range, which can be a money saver. They can detect motion up to 1,000 feet around the device and are smart enough to determine between what can be a threat in your home and what isn’t. They only “wake up” or turn on when you arm your system and need their protection. Motion sensors have come a long way from the original models, becoming much more reliable and less prone to false alarms. When motion sensors came into the security world, they were considered “active” devices because they emitted microwave or ultrasonic energy in order to see what was happening around them. Even though there are still a few sensors that use this technique, most have adopted a more modern way to detect motion. Today, motion sensors use PIR or Passive Infra-Red energy to detect the heat given off people and animals. These smart devices look for objects that are warmer than the surrounding area with their beams of passive energy. Then, they look for the heated area to move. When the sensor detects movements, it trips the alarm. A motion sensor is the main device that detects when someone is in your home when they shouldn’t be. When a sensor is tripped, a signal is sent directly to your system’s control panel and then to the monitoring company, alerting both you and the authorities of an intruder in your house. Today’s sensors are intelligent enough to be pet friendly. Since the sensors tack the heat of a person, it could be assumed your house dog or cat could most likely trip the alarm, but really, the Frontpoint motion sensors are able to recognize that objects with a heat signature under forty pounds are not a threat and just a pet. So, it would trigger the alarm if your cat or dog passes past the sensor’s range, which comes in handy when you’re away from home and your pet is at home. It creates fewer false alarms that way. How smart! 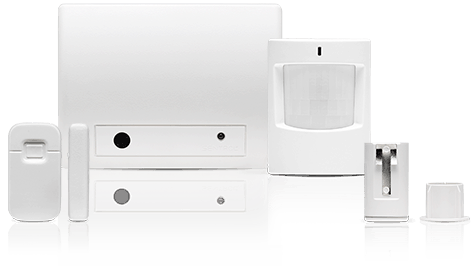 The standard range of each motion sensor is about thirty to thirty-five feet. The coverage area is shaped like a large water droplet, with the skinny-most part at the detector. The sensor’s beams project out and down, so that they can pick up anyone who tries to crawl and avoid them. When thinking about installation, the idea spot to put your sensor would be in a high traffic area that an intruder would most likely cross. You want to think about all possible points of entry and places where you, yourself, move in and out daily. Think hallways, living rooms, by the back door, etc. Also keep into mind of possible moving objects that could blur the sensor’s visibility. Do not hide the detector behind anything or place it in a spot with a harsh wall angle that could hurt its viewing range. It is wise not to point them at a heat source either, such as a stove or fireplace, and keep away from windows that could get warm from sunshine. In the same turn, don’t use them in a place that may get hot, or the sensor will not be able to detect a heat signature different from the warm background. Garages in a warm climate are a good example of this, unless they are air-conditioned. Installation is simple. Frontpoint gives their customers the choice to put in their own systems, so they design their products with easy installation in mind. If you don’t want to do it yourself, you can always request one of Frontpoint’s technicians come out and install the system for another cost. The motion sensors can be placed on a wall or on a shelf. They have an easy “peel-and-place” design and setup with a sticky adhesive on the back. Simply peel and place the device wherever you want. If you want it to be moved, it is easy to remove and put it in another location. The sensors arrive configured and ready to go. And because they are wireless, there is no electrical needed or holes to drill in your walls. As long as you have Internet available, the link-up to the control panel is a breeze. If you would like more information on Frontpoint motion sensors, you can always call Frontpoint’s easy to use customer service department and speak to a representative. 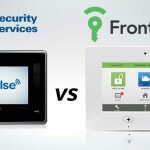 They are trained to help you customize your security system to fit you, your home, and your lifestyle. 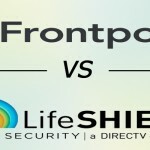 And Frontpoint prides themselves on their outstanding customer service, so they are always willing to help their customers and find the most reasonable solutions. Frontpoint’s easy to use methods make adding motion sensors to your security system simple, and that’s a relief when these sensors are so important in protecting your home from invaders. Because of their new more intelligent design, keeping your pets at home doesn’t have to be a worry and you can be assured that the things you love are being guarded under the motion sensor’s PIR eye.